After a brief Bon Voyage party in their Constitution stateroom, the Ricardos join the Mertzes on the ship's deck to wave their final good-byes to Little Ricky, Mrs. McGillicuddy, and Mrs. Trumbull. Lucy can't bear to leave her little boy behind and rushes off the ready-to-sail ship to give the baby one last kiss. While saying her final farewells on the dock, Lucy's skirt gets caught in the chain of a Western Union messenger's bike. She struggles valiantly to free herself, finally slipping out of her skirt completely, but, alas, she misses the boat. Advised to catch the pilot boat that would take her to the Constitution, she misses that too, leaping bravely aboard the boat coming in, not the one going out. It is next suggested that she hire a helicopter at Idelwild; high above the New York harbor. Lucy begins to have second thoughts about going to Europe at all. The chopper pilot assures her there is nothing to worry about as he slowly lowers her onto the deck of the London-bound liner. Special Notes: Goateed "Lucy" writer, Bob Carroll, Jr., can be seen standing beside Vivian Vance in the bon voyage scene. 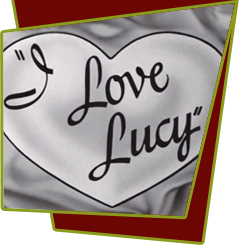 The wife of a friend of film editor Dann Cahn's was Lucy's double in the far away helicopter scenes. Jack Albertson (Helicopter Clerk) would later become famous for his role on Chico and the Man. Bloopers: In the scene where Lucy is being lowered onto the deck via helicopter, Ricky grabs her by the waist to hold her down, but the helicopter pulls her up a few feet and Ricky goes with her; at this point he accidently kicks Vivian Vance in the face with his heel while dangling in the air. Just before Lucy lands on the deck, the plain wall next to the ship is supposedly the sky, but Lucy's shadow can be seen cast on the wall.